Supposing that you have bought from Cartridge Save in the past then you will already know that we're highly affordable on the price of Xerox M123 toner cartridges. Every single order placed for this Xerox WorkCentre M123 toner cartridge is backed by our renowned low cost promise, ensuring that you spend as little as possible. We pride ourselves on supplying high quality toner cartridges for the Xerox WorkCentre M123 printer that have been rigorously tested by industry experts in order to guarantee efficient performance. Cartridge Save offer you a, rock solid cash back guarantee on this Xerox WorkCentre M123 toner cartridge so you'll never be forced to put up with a poorly performing cartridge. Remember, we offer fast and free on Xerox WorkCentre M123 toner cartridges with no further costs or concealed costs. Buying your Xerox Toner with Cartridge Save could not be easier. Our friendly customer satisfaction team are available to guide you all the way. Place your order to start saving. Designed for small workgroups, the Xerox WorkCentre M123 is a copier and printer using monochrome laser technology. The WorkCentre M123 multifunction printer has a maximum copy resolution of 600 x 600 dpi and a print resolution of 1,200 x 1,200 dpi. The unit delivers high-quality output from greyscale images to solid black text documents. 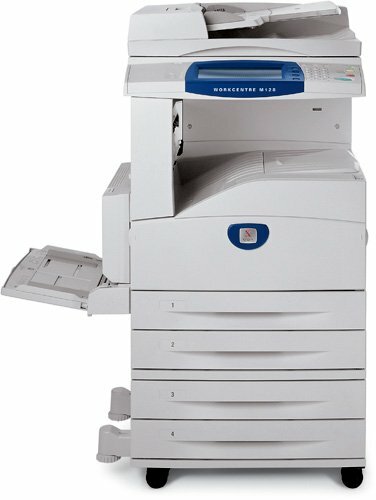 The Xerox WorkCentre M123 MFP can deliver 75,000 pages per month. Automatic double-sided printing is optional and only Windows drivers are available. This compact unit can handle 3,100 sheets at a time. The Xerox WorkCentre M123 mono laser printer is equipped with 256 MB memory and it has parallel, serial, Ethernet, and USB connectivity. The control panel on the Xerox WorkCentre M123 multifunction copier is very easy to use. The whole unit is supported by a base with wheels and optional finishers are offered. Print and copy speed can go as fast as 23 ppm. This reliable unit is easy to use and it requires little maintenance. The Xerox WorkCentre M123 black and white multifunction printer has good features such as scan once print many to continuously copy up to 999 pages. The WorkCentre M123 also has high paper handling capacity and offers good connectivity options. Featuring a long-life Xerox M123 black toner cartridge, this device can print up to 30,000 pages before the toner needs changing. The Xerox M-123 printer could be better if it had standard automatic document feeder and duplexer. This unit only offers optional fax machine and the printer is only compatible with Windows operating systems. Though output quality is good, the same cannot be said for the disappointing performance speed. The Xerox WorkCentre M123 is not ideal for large or more demanding work environments.